‘Necessity is the mother of invention’ which means necessity or need can encourage inventive solutions to challenging situations. Fellow metal detectorist “Trickworm” shared his solution to saving over $60.00 when he designed this Lesche Sheath and Pro-Pointer Combo. You can also do this simple modification yourself, and it won’t cost you additional money for an aftermarket sheath! 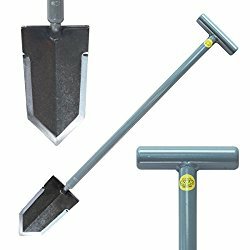 This Do It Yourself project merely requires determining the angle that suits your needs for easily removing the pinpointer without hitting the guard on your digger. Then, just sew your Garrett Pro-Pointer sheath to your digger sheath, and you have an awesome combination that keeps all of your diggin’ tools in one easy to reach place. That means less fumbling around for your digger or pinpointer and more goodies in the pouch ! Tip: Be sure to only sew on the edges. This entry was posted in Doing Good, Metal Detecting, Metal Detecting Tips and tagged Detecting Tips, digging a plug, garrett propointer, metal detecting, metal detecting tips, pinpointer, Pro-Pointer, target recovery. Bookmark the permalink.